As designers, one very important part of our job is to accurately convey to others the concepts we create. Contractors and builders, for example, like to see our designs expressed in detailed construction documents. The clients, on the other hand, are often satisfied with colorful renderings depicting the final versions of the spaces in which they will ultimately live or work. But sometimes you just can’t accurately show everything you need to with ink on paper, no matter how precise and detailed those efforts may be. Sometimes, especially when the project is adding square footage upward or outward, you really want to stand back and imagine the new structure in its planned location. Sometimes, that’s actually required before the permits can be approved. Such is the case with our Adair Cottage and Barn project in Portola Valley, in which existing structures will give way to new construction, designed from the ground up. The new buildings will include a guesthouse and a two-story structure that will accommodate office space over a vehicle garage. In keeping with the quiet and rural personality of the neighborhood, the house is designed with traditional farm influences. 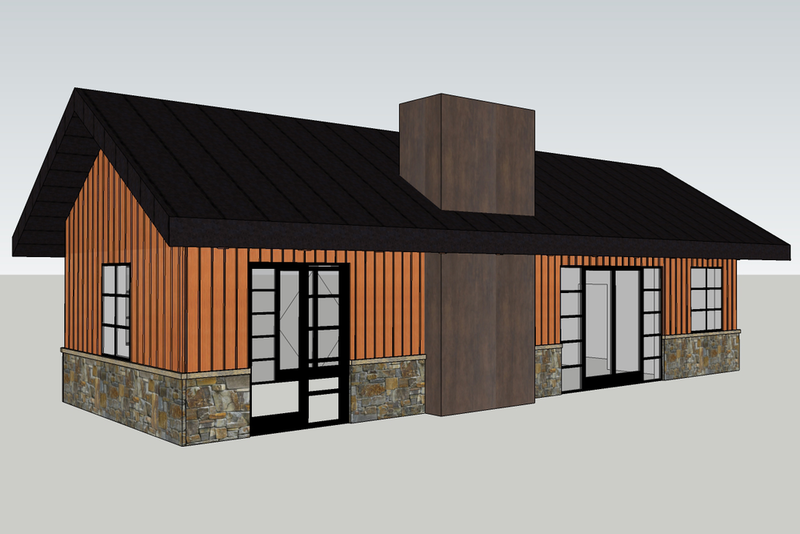 The garage — or “barn” as it has been dubbed — will be built on the site of the current tack house and will draw inspiration from the original structure. But even with tasteful designs that aim to complement the existing landscape, people want assurances that proposed construction will be in keeping with the integrity of the surrounding area. And that’s where story poles come into play. The story poles for the Adair Cottage and Barn were in place last week and our designs received the required stamps of approval. In the coming months, those 3D line drawings will be replaced with actual structural materials and what we’ve worked so hard to conceptualize will become a physical reality. Check back to our blog often for updates on this awesome project. One word many people use to describe the overall feel of their ideal design is “modern,” especially when the design is meant to update an older space. What they typically mean is they want the style and characteristics of their new space to be current and recent. They want something contemporary. “Modern” is a funny word when used as an identifier of style. Historically speaking, modern describes the span of time around the years 1500 to 1800. But kitchen and bathroom fixtures from that time period haven’t yet come back into vogue, and their electrical and lighting designs really wouldn’t meet current building codes. In the design world, modern describes a specific style movement that was considered “contemporary” from the 1920s through the 1950s. Carefully selected elements from the modern era, as well as those from various other design periods, are often brought together cohesively by present-day designers. By those same design world definitions, contemporary describes the time period between the 1980s and now, whenever “now” happens to be. If represented on a timeline, it’s typically preferred that contemporary design sits a little closer to the now side than the one bookended by Reagan’s move into the White House. Technically speaking, unless there is a mass shift by the design community at large to either go back in time or far ahead into our estimated future, contemporary design, by its very definition, will be “modern” as long as there is a now for which it to refer. Luckily, the DM+A team keeps itself up to date on current and emerging trends in architecture and design. We study and research current popular designs, and we know what’s needed in order for those designs to meet strict building codes. We’re watching the trendsetters, but our work is accessible enough to set trends of our own. We know hip and with it and chic and sophisticated and cool. In short, DM+A knows contemporary. But we also know modern. Yes, actually, if not eaten soon, those tiny buildings may indeed house ants. Today, however, they’re occupied by marshmallow snowmen, gummy bears and various other sticky sweets with which the youngsters chose to adorn their creations during this year’s annual Gingerbread House Decorating Party at Edgewood Center for Children & Families. All year long, we’re the creators. Guided by our clients’ specific needs and desires, we help transform their projects into beautiful and unique commercial or residential spaces. We’re great at what we do and we’re thankful so many people continually place their trust in our architecture and design services. But once a year, we look forward to throwing the building codes out the window and handing complete creative control over to the children of Edgewood. We supply the basic gingerbread structures, the candy-coated chocolate building blocks and the adhesive sugar icing. The children supply the design skills and all the labor. Wasting no time with meticulous measuring, and with very little regard for structural integrity, the children got to work this year renovating their plain gingerbread houses into edible works of art. We got to enjoy the creative process as spectators, our roles relegated to little more than replenishing the supplies of candy canes and gumdrops that were used as wall beams and multicolored roof tiles. Though we had no expectations until that final peppermint candy was iced into place, this party is an old tradition for us, and one that everyone involved looks forward to every holiday season. More than twenty years ago, the first Gingerbread House Decorating Party took place at Edgewood, a center here in San Francisco that serves children and families who have experienced traumatic stress leading to learning disabilities, mental illness and debilitating behavioral issues. Since 2008, our own Gregg De Meza has spearheaded the annual party, aided by a crew of helpers made up of DM+A’s staff, family and friends. This party is more than just an afternoon of smiles, laughter and the inevitable sugar high. It’s about appreciation for opportunities — the opportunities Edgewood helps to afford to their children and families, and the opportunity we’ve been afforded to do what we love every day here at DM+A. And, already, we’re looking forward to the opportunity to do it all again next year. Color matters in design. When designing with color, always consider the psychology of color, as color can impact mood, lighting and the overall success of a space. Here at DM+A, we love injecting a youthful vibe into a space by using a hint of yellow. With all of it's positive attributes and the right dosage, we can create fun and memorable spaces. For tips on using yellow as an accent color in your home, check out 10 Ways to Use Yellow in Your Home Decor. Cristina, thanks for brightening our day with a feature in your latest article on Martha Stewart. SFDS 2015 - It's a Wrap, Thanks to All! So concludes the 2015 San Francisco Decorator Showcase House. We had a great time designing and executing a wonderful little space for a lucky young guy. Much thanks and gratitude to the homeowners, the staff at University High School, Jenny Bitner, and Thelma Garza. The event could not happen without you all! Thanks to our construction team at Cook Construction; Greg Cook, Maija Markula and Jesse Beyer for putting our space together. For our well lit space, many thanks to Lighting Designer Claudio Ramos of Banks Ramos and his team Linda Cooper of Lighting Systems and Tim O’Keefe of Luminii. For our finishes and materials, big hugs to Helena Jausas of Spec Ceramics who outright donated the large format tile. A big shout out to Steven Stolman at Kohler for donating all of the plumbing fixtures, and to Jonathan Graves and Shonda Dawson of Dal Tile for their help with the glass mosaic tile. For the showstoppers, the bathroom wouldn’t have been possible without the generous help from Sozo Studios’ Cynthia Miyashita, Josie Biteng and Allyssa Kucera who designed and fabricated the gorgeous vanity for us. Alex Blair and Joseph Radovilsky, owners of J&A Stone and Tile for helping us make a splash with their tile installation. And of course to the guys (gals) at DM+A: Rachel Malchow, Lisa Woo, Lannette Guerra and Danielle Johnson, without whose tireless efforts the project wouldn’t have happened. Last, but surely not least, let's give thanks for the art. Thanks to local SF street artist Jeremy Novy for his awesome installation of the 'No Diving' symbol, and to Lisa Chadwick and Melissa Ross with Dolby Chadwick Gallery for loaning us the lovely artwork. Thank you Red Carpet Bay Area for the mention! I had to share this great photo of our fearless leader, Gregg De Meza, taken by Drew Altizer Photography in the bathroom we designed for this year's San Francisco Decorator Showcase. Karter's Bath is for a 9-year old boy. The family loves modern art, so we turned to David Hockney’s Swimming Pool with Reflection for inspiration. We wanted to bring the energy of this piece to life in color, texture and light and we are so pleased with the results. Please stop by for a peek before the showcase house closes on Memorial day, Monday May 25th. Looking for some heat during these cool San Francisco nights? We love ModFire's latest outdoor fireplace, Solfire. There's something so Mid-Century modern about this piece, it makes me feel like I'm on the set of "Mad Men". This fireplace will have you gathering outdoors with Martini's and any other brown liquor in hand. Don't forget the ice! Well, we all did it! Opening night at the 2015 San Francisco Decorator Showcase House was a night to remember. Congrats to our fellow designers, your rooms are inspiring and oh so cool! On trend this year are textured and patterned wallpapers, high gloss reflective ceilings and draperies with gorgeous adornments. Many of the spaces take on a very masculine or feminine feel. Since we designed Karter's Bathroom this year, this post is dedicated to the bathrooms in the house. These rooms go beyond utilitarian; they're space to brighten your day, to soak in, literally and to refresh your soul. Karter's Bathroom, for the families young, sophisticated son, was inspired by the David Hockney piece "Swimming Pool with Reflection". The over scale "No Diving" wall/ceiling art, installed by San Francisco Graffiti Artist Jeremy Novy is a playful nod to the swimming pool diving board and the modern art piece Atmosphere River V, 2015 by Artist, Hunt Rettig in synthetic rubber and acrylics encapsulated in a polyester film, read as sunlit water in the pool. Big thanks to Lisa Chadwick and Melanie Ross at Dolby Chadwick Gallery for providing the artwork in our space this year. For the families daughter, Nest Design created the ultra feminine, Lips Bathroom. The vanity sconce light fixtures are a must see! Thank you Rob J Photos for the images. Two other spaces with feminine appeal is the ultra glam En Vogue Salon designed by the fabulous Tineke Triggs of Artistic Designs for Living. Every detail in this space was accounted for, from the mesh fabric used as window sheers to the ceiling treatment. I want to live in this space! Julie Rootes designed the beautiful Powder Room full of glitz and glamour. That tile, that sink, that wallpaper, need I say more! There are so many more amazing spaces to mention, but so little time. Please visit the showcase house and see for yourself, but if you don't have the chance, SF Curbed showcases the house in all it's glory, thanks to the amazing photography by Patricia Chang Photography. Check out the house here. Demo Done. Hard Hat Party On! Being a part of the San Francisco Decorator Showcase is not all work, and no play. With demolition complete, our California Cool Bath project is moving along as planned. So with work in order, we will play. The Decorator Showcase House is in demo mode, so why not have a party? That's exactly what happened. Last week we attended the 1st of many parties for the showcase house - The Hard Hat party. A time to appreciate the beautiful 9,700 sq ft home designed by Architect Julia Morgan and to catch up and connect with fellow designers and vendors. Connecting we did. It was so awesome chatting with Alexandra Ray of Five Senses Art, about that perfect piece of art for our showcase room. Thanks for sending your ideas, Alex! Love the idea of a skateboard for a young boy's space - Spin Yellow, 2009 by Damien Hirst is super cool. Also a big thanks to Thelma Garza, Director of Events and Special Projects at San Francisco University High School for keeping us in the loop and making things happen! Looking forward to the April 25th Opening Party to be blown away by all of the creativity and sheer gumption from the many top designers of this years showcase house.